The Lodge makes every day an adventure with its endless activity schedule. Residents find our wide variety of activity offerings fulfilling in so many different ways—whether you are passionate about music or excited to explore the outdoors—our full-time Activity Coordinator provides a fun environment to connect you with your community and grow as an individual. We believe in an environment that is stimulating—socially, physically and mentally—and we strive to give our seniors opportunities to tap into perhaps unknown interests. Don’t know much about cooking? Take a cooking class and get introduced to the art. Whether it's crafting in our activity room or happy hour in our lounge, residents are able to enjoy a carefree setting where they can connect with fellow residents. Scrabble, Pinochle, Trivia, or Bridge—you pick! 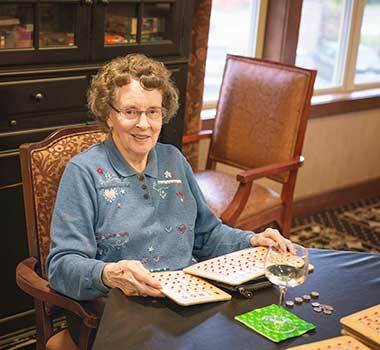 The Lodge offers games and puzzles that residents can take part in whenever they wish. Looking for something a bit more relaxing? Visit our spa or participate in a Tai Chi class taught by fitness professionals. Shop till you drop... We provide frequent trips to go shopping in Gig Harbor’s Uptown Shopping Center, as well as trips to Muckleshoot Casino, the YMCA, The Brothers Greenhouse, and more. With our complimentary scheduled shuttle, leave the driving to us and enjoy countless social and recreational trips. Families are encouraged to get involved, whether that’s attending special events, outings, and support groups, or by participating in our daily activities. We would love to tell you more about life at The Lodge! Check out activity offerings in more detail below. Contact us for more information.